Goetta is not Cincinnati’s most well-known culinary export. That would be Skyline Chili, which I refuse to call “Cincinnati style,” because that would be acknowledging the existence of rival chain Gold Star Chili, and that is unacceptable in my household. Nor is it the city’s most gourmet offering; Graeter’s ice cream, particularly its black raspberry chocolate chip flavor, takes that title. No, goetta is a humble food, developed by working people with hungry mouths to feed and not quite enough sausage to feed all of them. It’s also, probably not coincidentally, the only food I’ve mentioned to never make it out of the Greater Cincinnati area—not even to Chicago where I now live, and where Ohio expats are about as common as scarves in January. Goetta (rhymes with feta) has its roots in European peasant food—the gruetzwurst family of sausages—but was developed in America. Although its recipe is similar to Scotch-Irish white pudding, it’s distinctly Germanic in origin, with variations popping up wherever large numbers of German immigrants settled. As with most traditional working-class dishes, goetta takes something expensive and stretches it out with common commodities. 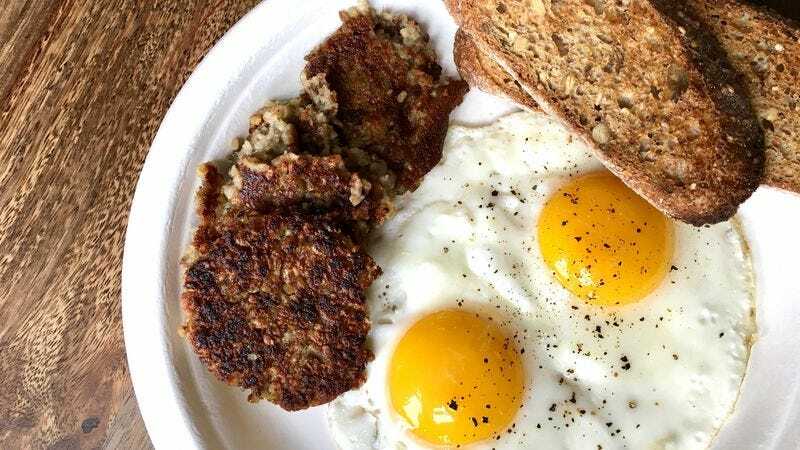 Like Pennsylvanian scrapple or North Carolinian livermush, goetta takes scraps of meat that would otherwise get thrown away—pork, sometimes beef, or offal—and combines them with grains. The resulting mixture is then spiced, smushed into a loaf, sliced, and pan fried to crispiness. Where goetta differs from its cousins is that the meat is stretched out with steel-cut oats, like haggis. The coarse oats lend the sausage additional backbone, resulting in an appealing texture that’s crispy on the outside and mushy in the middle. Think of it as breakfast sausage and hash browns combined into one delicious foodstuff, or even a meaty latke. Goetta, like the best proletariat food, is incredibly versatile: You can put a slice between bread, on top of a burger, or substitute it for toast to sop up the yolk of a fried egg. You can also just have it on the side, like any other breakfast meat. And thanks to its crisp potato-like texture, goetta is the rare sausage that pairs well with a dollop of applesauce. The best goetta is made at home or in a German butcher shop, but there are also several store-bought brands on the market. The most popular is Glier’s, whose label earnestly proclaims, “Goetta: The ‘o’ is silent, until you try it.” The Glier’s factory is located next door to the Anchor Grill in Covington, Kentucky, a popular 24-hour diner whose wood-paneled walls and nautical-themed tchotchkes have remained unchanged for decades. (So has the jukebox, for that matter.) The Anchor is known for its G.L.T. alongside its goetta-centric breakfast offerings. It’s located across the Licking River from the Thompson House (formerly known as the Southgate House), a historic mansion-turned-music venue where I spent many sweaty, soggy nights in my teens—with a plate of eggs and goetta afterwards, naturally. Glier’s has the distinction of containing offal—pork hearts and pork skin, specifically—which appear as headcheese-like dark pink chunks in the otherwise pale gray raw patties and give Glier’s a noticeable funky smell before it’s fried. That funk, as pork enthusiasts are well aware, translates into wonderful depth of flavor. Glier’s also comes in a “hot” variety, although the spice level is, let’s say, Caucasian. (Cooking up a batch of goetta at the A.V. Club offices, food editor Kevin Pang asked me: “Do you put hot sauce on this?” I replied: “You could.”) Glier’s biggest competitor is Queen City Sausage, whose goetta is made with “super trim” (although it’s greasier than Glier’s) pork and beef and tastes just like a regular old sage breakfast sausage. Perhaps even more nostalgic than the taste or texure of goetta is its sound. Fried in a skillet, goetta has a tendency to pop as it sizzles, bits of pork and oats flying off the patty like popcorn. My grandmother never flinched when goetta would pop, sending oats soaring across the kitchen and misting the stovetop with pork fat. Neither does my mother. When I was a child, I’d get startled by the noise, but now I don’t flinch, either. In fact, I’ll reach right into the pan, grabbing a piece by its corner and gently lifting it up to see if it’s brown yet on the underside. My hands have become calloused from years of standing in front of sizzling skillets, brushing off the occasional errant speck of hot grease like a pesky fly. Because we are practical people with much to do, we like our food as humble as we are. And goetta is a food with heartiness and strength to match. Oh Damn, The Browns Traded For Odell Beckham Jr.